Travel Slowly. Bring the Kids. Go Light. August 12, 2011, Washington, D.C.: Several interesting tidbits in D.C. news this week examined issues related to our city streets and sidewalks. Each discussion brings to mind memories of my recent trip to Greece, where I was reacquainted with the benefits of Europe's sidewalk culture and pedestrian streets. With this week’s 50th anniversary of D.C.’s first sidewalk café, many journalists have recalled how fearful city planners were of the proposition back in 1961. An article this week on GreaterGreaterWashington.org also touches briefly on sidewalks in examining the number of commuters driving into D.C. for work. While the focus of the piece is on D.C. jobs going to residents of Maryland and Virginia, the author says a consequence of hiring more D.C. residents for jobs within the District would be the alleviation of congestion on city streets. He asks us to consider how places would change if wider sidewalks flanked, for instance, Georgetown’s M St., as one way to deter its existing cluster of cars. Wider sidewalks, more café seating and fewer cars clogging the roads are all concepts that (again) bring to mind the writings of Jane Jacobs. In her 1961 book, The Death and Life of Great American Cities, Jacobs wrote that well-used sidewalks had the power to improve neighborhood safety, to encourage casual public life instead of an isolated private one, and even to assimilate children into city living. Today I wonder what we'll think 50 years from now about our city's congestion. Will we think we were crazy back in 2011 to be fearful of widening sidewalks, scaling down on roads and encouraging walkable cities, just as people were once fearful of the riffraff that could linger at sidewalk cafes? What I do know is that city sidewalks and pedestrian streets are wonderful spots within our great urban neighborhoods. 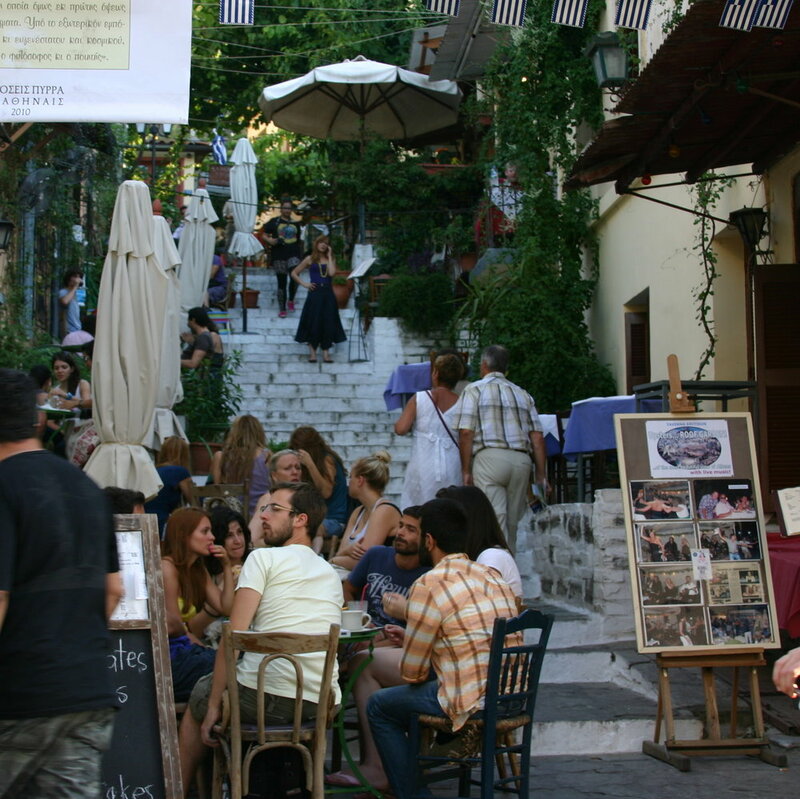 I think fondly of walks on pedestrian-only streets in Athens' La Plaka neighborhood, where cars could travel if only they were allowed to replace wide, cafe-filled sidewalks. On evening walks in my neighborhood, I sometimes imagine more places like this in the future, like a lovely tree-lined pedestrian walkway down the middle of Pennsylvania Ave. by the Eastern Market Metro. Especially on an abnormally cool summer day like today, I can’t imagine what places like San Francisco's Polk St. or D.C.'s Barrack’s Row looked like back in the days before people were allowed to eat outside.